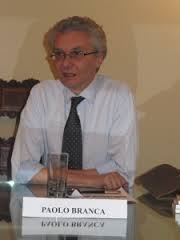 Paolo Branca is full professor (level 2) in Arabic and Islamic studies at Università Cattolica del Sacro Cuore, Milan. He also taught at University of Turin and University of Pavia. He graduated with honors (1982) in Oriental Languages at the University of Venice Ca' Foscari, with a dissertation on thought of the Egyptian writer Khalid Muhammad Khalid. He attended different workshops and conferences as speaker and gave lectures in several institutions, such as Pontificia Universitas Urbaniana, Institut du Monde Arabe - Paris, Université de Lausanne, University of Florence, University of'Ain Shams - Cairo (Egypt), State University of Milan, Université Saint Joseph (Beirut).